...... A pop-up will notify you when your friends update their statuses, write a new note, or interact with you on Facebook. Connect with Friends by clicking icon to open the Facebook friends sidebar. You can sort your friends by name or status and easily interact with them and their profiles. Share the page that you are currently browsing by sending it to friends or posting it to your profile using 'search' button. Facebook Toolbar New Version 1.4 adds the ability to upload photos to Facebook, including album creation, tagging, and captioning and fixes a bug with setting statuses containing HTML entities. 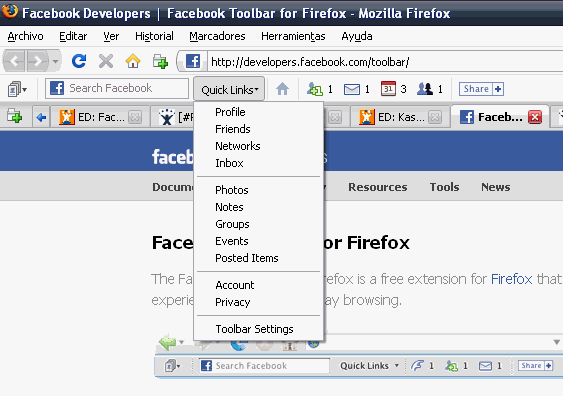 Qweas is providing links to Facebook Toolbar 1.4 as a courtesy, and makes no representations regarding Facebook Toolbar or any other applications or any information related thereto. Any questions, complaints or claims regarding this application Facebook Toolbar 1.4 must be directed to the appropriate software vendor. You may click the publisher link of Facebook Toolbar on the top of this page to get more details about the vendor.